Hi, my name is Vicky I started to macrame a few years ago for fun and it became addictive. I love spending time with my multitude of cords ans sparkly beads and crystals, the primary materials for my jewelry. When I first started I knew only the basics, I'm now able to design my own pieces and you can see some of them here on my site. My items are NEVER mass produced! They are all HANDMADE, they are unique and due to the nature of my technique, which is time consuming, I never produce too many of one kind. Even handmade products can be mass produced as some items are "quickly" hand-assembled only, with ready made components, thus allowing higher number of pieces to be finished in short amounts of time, it is not so with micro macrame, this type of work takes many hours. Once a certain design is completed I usually get requests for that design in various sizes, colors, or with light modifications, which make the piece unique and personalized to one's taste. CUSTOM REQUESTS are always welcome and I try to accommodate as much as possible. 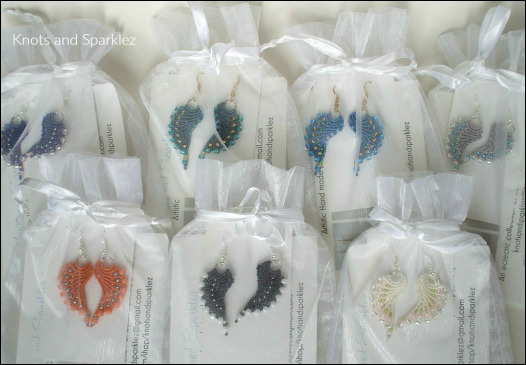 specific size, closure type, colors, charm choice, bead choice and more. I have had also requests for reproductions of items or reuse of particular beads from previous pieces owned by the customer, etc. ​FEEL FREE TO INQUIRE - THERE IS NO OBLIGATION. For comments or questions please visit the "Contact Us" page, or just send me an e-mail.
" 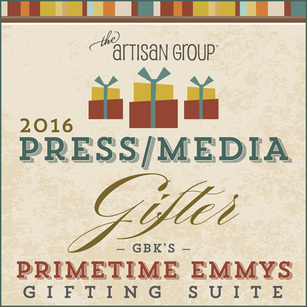 KNOTS AND SPARKLEZ participated in an exclusive celebrity Gift Lounge event, hosted by GBK Productions in Beverly Hills, California, leading up to the Primetime Emmys telecast" on September 16-17 2016 and we gifted these feather light and colorful hand knotted Angel Wings Earrings. Here is the Official TAG publication for the Event with all the beautiful gifts and talented artists. Because it is the work of an Artisan, his/her feelings, thoughts, ideas, emotions, so much goes into artisanal work. You see the finished piece, but this piece was born out of an idea sparked by a color, a shape, a thought, it slowly took form, many times it goes through a long transformation process as the artisan encounters road blocks and has to recreate his/her path to the finished product. Sometimes that product differs vastly from the artisan original idea, but in the end it is with pride and joy that said piece is offered to you, no matter what your taste or feelings about it, it is that artisan’s greatest form of expression. 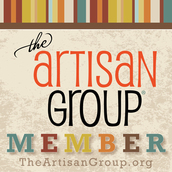 A community where you can pin on a board all things you like and share with your friends, fellow artisans, or others who share your interests; it could be your vacation pictures, or your artwork. Similar to Facebook but on Google, you have a newsfeed, communities, you can chat with friends via google hangouts, etc. 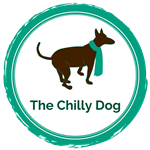 and if you love crafting you will find tons of projects, tutorials and so much more on The Chilly Dog . You can click on the CRAFTSY link above to view Tutorials and explore a world of Crafts Lessons and more.